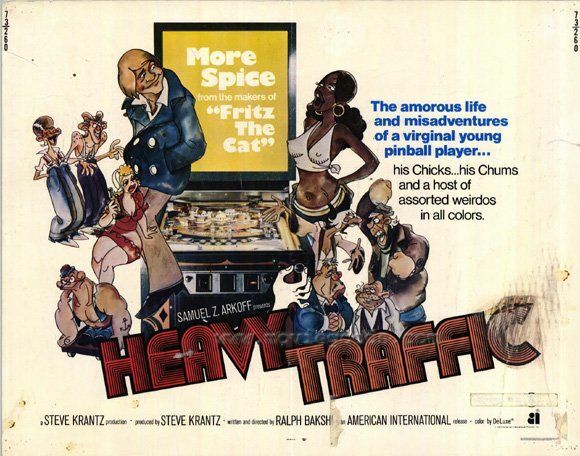 Deeply personal and willfully repellant, Ralph Bakshi’s Heavy Traffic is not the most coherent film in the entire world. It depicts the world of an aspiring underground cartoonist through a mixture of live action and animation, both of which are rendered in grotesque strokes. Our hero is the virginal artist Mike (Joseph Kaufmann), who is introduced playing pinball. He lives a monkish existence inside a tenement apartment whose environment is a little like The Honeymooners if it were designed by Breughel and written by Tennessee Williams at his most Sophoclean. The women are mile-a-minute shrews who always seem to have a mammary breaking free from their blouse. The men are thick-lipped ethnic caricatures. They think with their dicks—which inevitably are also put on display—and are unable to control their bodily functions. Eking out an existence in the New York underbelly, they take out their impotence on their women. There’s a wonderful moment about two minutes into this trailer–maybe where Nicolas Cage starts going on about the iguanas–where what seemed like a horrible idea suddenly has the potential to become quite wonderful. Philippe Petit better have a few more acrobatic feats in his arsenal. He famously balanced an Oscar on his chin at the Academy Awards. The man who walked between the Twin Towers got another chance to dazzle when Man on Wire won three prizes at the Cinema Eye Awards in New York. The crowd-pleasing Wirewas recognized in the Outstanding Achievement in Nonfiction Film-making category, as well as production and editing. Vals Im Bashir/Waltz With Bashir doesn’t have any magic tricks, but director Ari Folmanwill no doubt be pleased that his animated documentary won four prizes, including Outstanding Achievement in Direction. The other big winners (in fact, the only other winners) included Werner Herzog’s Encounters at the End of the World and Up the Yangtze, whose director Yung Chang won Outstanding Debut Achievement. The full list after the jump. Part of the art of being a filmmaker is being a great bullshitter. It’s true of Harmony Korine, it’s true of Werner Herzog, it’s true of James Toback, of whom more in a bit. And it’s certainly true of Brett Ratner, a fauxteur short on talent but long on those skills which are most necessary when doing lunch. Film has in return been very good to him, and now the unabashed fan is spearheading the reprints of some of his favorite cinematic literature.